Go check out the recap and photos at the PVC Women’s Blog. I was pretty excited about a race so close to home. Instead of driving 2+ hours to a race, there was a nice one in my “back yard” of Auburn, Maine, only 45 minutes away. The pre-race jitters started 24 hours before the race. My stomach was doing flops all day Friday and into the morning of the race. The only time they really settled down was when I got on the bike to warm up. As soon as I had arrived I realized I had forgotten to pack my race license. I’ll tell ya, it seems like it’s always something before every race. Luckily they let me check in anyway – probably helped that I had registered on line. I seemed to stand in line forever for the porta-potty. Two were just not enough! Then with shaking hands I fumbled with pinning on my race number. Better to have it on early then to try getting it on right before. Ready to start warming up. 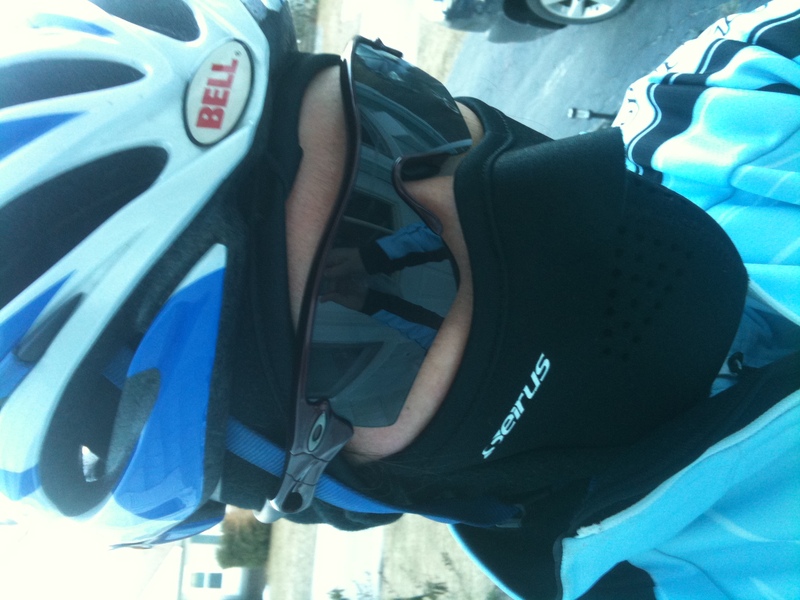 Finally I got on the bike to warm up. I went the opposite way of the route to avoid some of the climbs at first, to give me a better chance to warm up. Then it was time to turn around and do a little climbing, especially the big climb that the race starts with. Chatting with a friend before the start. The length of the route was 11.5 miles and the women raced 3 laps. After a downhill, followed by an uphill, the first half of the course is pretty flat and the second have has mostly rollers with a few short, steeper second. The finish is a falls flat that lends itself to a sprint finish. I’m always pensive descending in a large group so it’s no wonder I was pretty much dropped on the downhill but they slowed approaching the steepest climb. Of course I was completely dropped on that first climb. I could see a group way ahead when I got onto the flat section and had to work my tail off to catch back up. (Those time trial events are paying off!) I was happy to find that three of the 4 racers I caught were teammates. Once I had a chance to recover we all worked together, with two other racers, pacelining through the first two laps. Along the second lap we thought it would be interesting to try some team tactics to try to drop the other girls. They seemed to be growing tired and it would be better to drop them now and not have them stealing a better place finish from one of us. Then we tried to drill the pace a bit to drop the other riders. On our first try it worked well but then our pace eased up a bit and they were able to catch back on. It also didn’t help when I started getting cramps in my calves due to the effort. So then we tried to sit back without pulling through to see if we could tire them. Upon another surge by a teammate, I got dropped. I was able to get back on but unfortunately I brought the other riders with me. Then 1 1/2 miles from the finish my left calf seized! At the top of the first of the two-step climb I had to dismount the bike to stretch it out or I wouldn’t be able to finish the final climbs. I saw my teammates and the two other girls ride off without me and I couldn’t do anything about it. After a brief stretch I got back on the bike and prayed it was enough of a stretch to get me to the finish. It was. I crested the last climb and had sight of the final 1+ kilometer. I buried my head, anchored my hands in the drops and dug deep. I looked up and saw a rider in front of me and dug again. When I looked up again, I was closing the gap. So I kept on digging to close the gap and actually passed that rider right before the line. After the race she said she had no idea I was even there. I finished the race 11th out of 16. My teammates finished 8th and 9th and I know I would have also finished in the top 10 if it hadn’t been for my cramp. It was a fun race and I had a blast. It was especially liked trying to work some team tactics, even if they didn’t stick. I hope to be back again next year! What’s worse than DFL? DNF. I went to the Turtle Pond circuit race today. My goal was to hang on, have fun and learn. There was talk of launching the Pro1/2’s with the Cat 3/4’s but the decided not to do that after all. We hit the road at 1:25pm. The first climb up Oak Hill Road was neutral, something I was very thankful for. I managed to hold on throughout the first 8 miles of the 11+ mile course. It was the short steep pitch that I was dropped on, which I figured would happen. I chased but most of the front group was gone. I managed to hook up with a few CVC/Subaru team members and a few other gals. They got a little organized and started working together. I assured some of the CVC gals that I wouldn’t break them up (it looked like they wanted to remain together) so I hung out behind them. They worked their way to the front of our 7 man group and I offered to take pulls if they wanted. They were happy for the help and the 7 of us ended up taking pulls. And then it happened. The thing that happens often when I ride hard, in particular during hilly routes: the cramps started to set in. Mostly in the inside of my thighs. I was thoroughly disappointed. I would have finished the ride if it wasn’t for that. I even got off the bike during the race and stretched, to no avail. On the next time they were still there, ready to cramp hard. I even had to embarrassingly walk up the steep climb for fear of a cramp setting in and not being able to get off the bike. I didn’t eat much before the ride and even though I was drinking a lot, it wasn’t enough. The weather was brutally hot in the afternoon. When we were done and heading home at 4pm the outside temperature gauge on the car, which is pretty accurate, read 90 degrees! Everyone was complaining about how hot it was. Out of 45+ riders, less than 30 finished the race. Many of the girls abandoned due to stomach cramps, so I guess I wasn’t alone. Even though I didn’t finish, my teammate Meg had a very successful day and finished 8th and Julie finished 14th! Shannon and I were both DNF and Teresa managed to finish, even after a crash going uphill. Luckily it wasn’t a serious crash and she nor her bike suffered much damage. Teresa even told my husband that she was going to soft pedal and wait for me to catch up but he told her not to bother. He knows all too well that I could be suffering in a way that would not allow me to go on. In looking at the board at the end of the race I noticed where some of the CVC gals I was riding with finished and they were in the 20 mark. That’s probably where I would have been had I been able to finish. I would have been very happy with that. Out of 50 starters, less than 30 finished. There were many stories of muscle and stomach cramps in addition to the effects of heat exhaustion. I’m glad to have warmer weather but this was a little much! 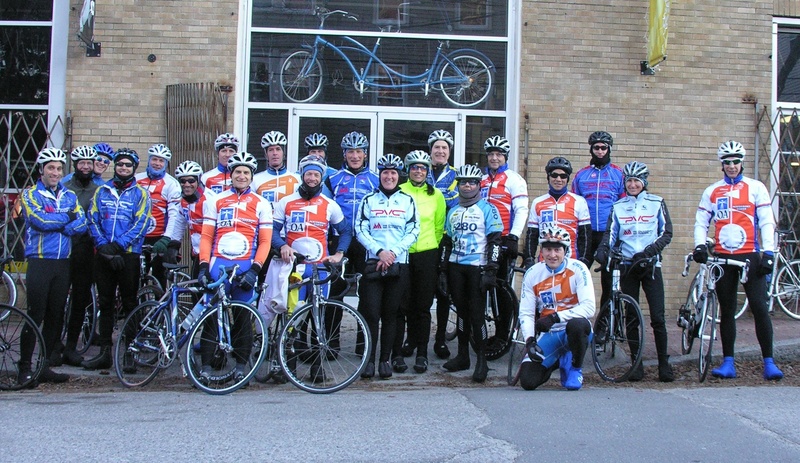 It was a good outing and I think everyone is fired up about the next big event: Lake Sunapee Road Race on May 16th.